Starring: Al Pacino, John Randolph, Jack Kehoe, Tony Roberts, Barbara Eda-Young, Biff McGuire. Every time I revisit a 70’s classic, my love for the era grows ever stronger. If there is one thing that films from that decade were, they were fearless. They didn’t care if they came across as raw, unpretentious and downbeat. They were more documenting the events of the time than any other decade in cinema. Serpico is a perfect example of that untamed energy and feelings towards the establishment, in this case the police. It also has one of the best screen performances from Al Pacino. Frank Serpico is dying. He has a bullet in the face and is being rushed to hospital by two police officers. Flashback: and Serpico is a fresh-faced rookie just graduating from the academy. He soon finds himself in a world where they are the law but that’s where the buck stops. All around him, officers are being offered bribes to look the other way. Serpico, with his moral attitude, doesn’t want to be part of this and yet, it seems, no one wants to do anything about it. So determined to be an honest cop in a dishonest world, he takes on the establishment, even to the risk of his own life. 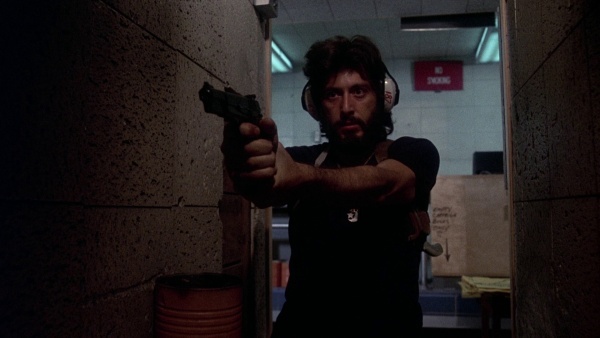 Serpico is a directorial triumph for one of Hollywood’s finest, Sidney Lumet. Managing to capture the events and story in the heart of New York, it has a naturalist, almost documentary feel about it. It doesn’t have to rely on shaky-camera work where you can’t make out what is going on but still it puts you in the heart of the action. It also has the feel of a proper adult film. 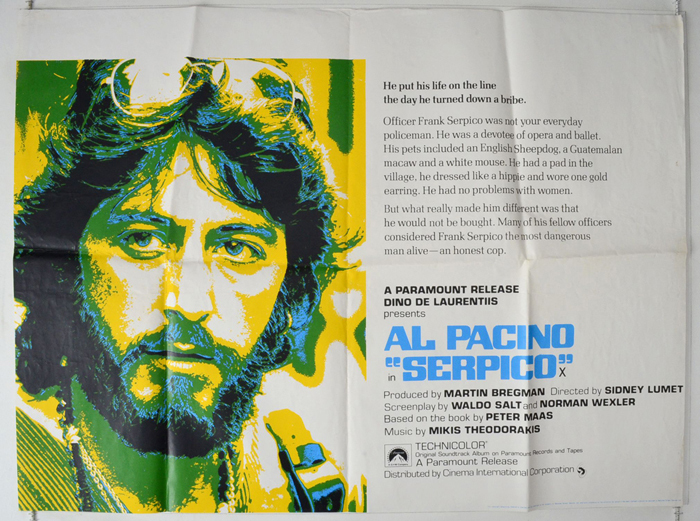 Unlike most cop movies of the time, where a big man with a big gun is running amok, Serpico is a small, scruffy looking hippie-type who is alone in his world, has very few friends and is making more enemies the more he shouts and complains. It doesn’t have to rely too much on violent set pieces but have moments where he’s chasing down a criminal, without the fanfare of an exciting score behind it, bringing the realism to the front. Based on a true story, as Serpico digs deeper, you find yourself wondering if there were any honest cops in the force at all. He’s moved from one precinct to another and yet the same crooked behaviour is uncovered. It’s as if he’s fighting a losing battle. These are reinforced with some incredibly uncomfortable scenes. One such is when Serpico arrests a known criminal, only to find him laughing and joking with other officers, making the honest cop take matters into his own hands. This is a powerful and unsettling scene, played beautifully by all involved and Lumet allows freedom for his actors to let the tension build. Waldo Salt and Norman Wexler, using Peter Maas’ source material, have sculptured an impressive script where the language is fruity and the characters are fully rounded, with an array of terrific supporting actors bringing the realism to the front. At the centre of it all is Pacino in the title role. Coming off the success of The Godfather, this is poles apart from his role as Michael Corleone. With his long hair, black bushy bread and sixties wardrobe, Pacino is an absolute tornado, bringing depth and emotion to the role. There are moments when you fail to sympathise with him and others where you can see he’s a man on the edge. Michael Corleone aside, this is Pacino’s finest hour, a masterclass in performance and hard to see anyone else taking on the character and doing such a great job. Serpico is up there with the best of the 70’s and if you are just starting out to examine the era, then this is a great way to begin. It’s a film that couldn’t be made today as it would probably upset too many people, plus Hollywood would probably water it down and give it an upbeat ending. Thus it should never be remake or rebooted but left in the vaults of cinematic history as one of the best, if not the best, police corruption thrillers of all time.